Learn the fascinating story of a Prisoner of Zion who managed to scrounge together a seder in a Soviet prison, and merited to see miracles. 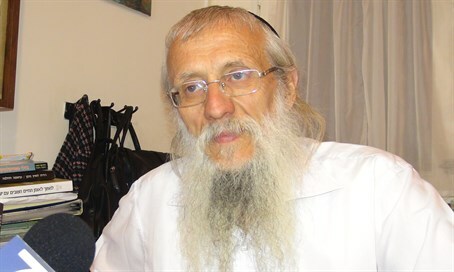 Former Prisoner of Zion Rabbi Yosef Mendelevich spoke with Arutz Sheva on Sunday ahead of the Passover holiday that begins on Friday night, and recalled back to when he courageously celebrated the holiday seder in a Soviet jail. Rabbi Mendelevich noted that as a former Prisoner of Zion, he did not require any imagination in order to fulfill the holiday obligation of viewing himself as having personally left slavery in Egypt. He then began relating the fascinating story of how he managed to pull together a seder in his last year in a Soviet gulag prison, where he was kept in a closed cell for three years for the "crime" of having observed the Shabbat. In jail he told his cell mate Hillel that they should hold a Passover seder, but due to the dangers and difficulties Hillel was skeptical, leaving the rabbi alone to try and scrounge the required foods for the festive feast. He had a small postcard with a picture of a seder plate from the Israel Museum that he had received from Israel, which was not confiscated because it had nothing written on it. Thanks to the picture of the seder plate he had the entire order of the seder written down to remind him what he needed. Rabbi Mendelevich then detailed how each ingredient he needed miraculously came within his reach. It started when a flu began spreading around the prison, and the jail's administration gave each prisoner an onion for their health. He put it in water to get green sprouts he could use for maror. Next up was matzah, and fortunately he was allowed to receive two pounds of bread. His sisters agreed to send him matzah from Israel, but they arrived broken into small pieces because the guards thought they contained a secret message. His father had sent him raisins, and the rabbi collected the sugar doled out to the prisoners which he then put in a jar together with the raisins and water, hiding the jar by a hot water pipe under his bed in hopes it would ferment and become wine. Then he had another stroke of good fortune, finding herbs growing from under the asphalt of the exercise yard. He took the small herbs breaking through the hard asphalt to be a symbol of freedom, and gathered them for his karpas. He did not have a chicken for the seder shankbone, but he did have chicken soup flavoring cubes sent to him by people from Kibbutz Yavne in Israel. Finally to wrap up his preparations he asked the guards for a copy of the Pravda Communist propaganda paper, which he used to craft a seder plate. As Passover arrived he approached Hillel and surprised him with the ingredients he had assembled. They found that the grapes had turned to wine, and Hillel had his first real seder according to Halakha (Jewish law). Then another miracle occurred - the next morning Hillel was taken from their cell. Rabbi Mendelevich thought he was transferred to another jail, until Natan Sharansky - who currently serves as executive chairman for the Jewish Agency - told him he was released the same day together with his other friends, and was already in Israel. In Israel Hillel told the rabbi's sisters about the seder, and they were relieved to learn that even in prison their brother succeeding in being a free man. "It depends on you and not on the conditions," concluded the rabbi.